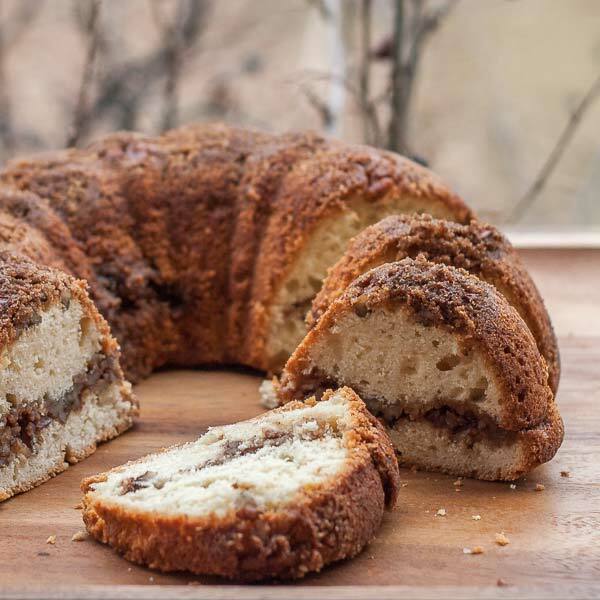 This classic coffee cake is simply delicious. 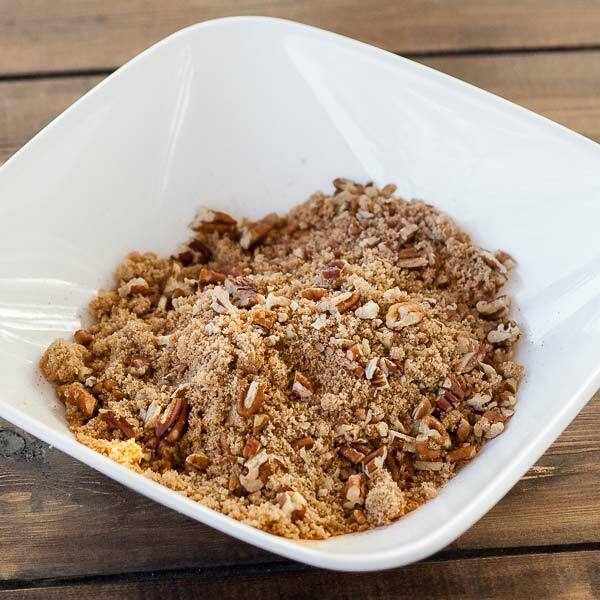 Made with cinnamon, brown sugar and pecan crumble, it will definitely enrich your morning coffee experience. The recipe has its sugar quantity somewhat reduced, because I do not like it very sweet, but you can add some more if you feel the need. Start with a stick of butter (110g) and ⅔ cup of sugar. The butter needs to be at room temperature, just melt it a little bit in your microwave oven. Mix them well for a minute then add vanilla extract,eggs, ½ cup of yogurt and ½ cup of sour cream. In a small bowl mix 2 cups of flour with 1 tsp baking soda and 1 tsp baking powder. Pour this mix onto the yogurt and sour cream mixture and give it a swirl with your mixer. At this point, your cake mix is basically done, now it is time to get the crumble ready. 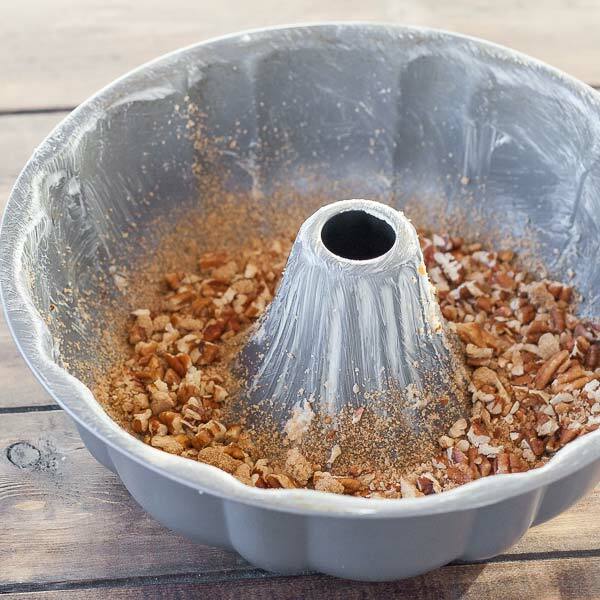 Chop some pecans or walnuts, add a tsp of cinnamon and ½ cup of brown sugar. Mix them well. 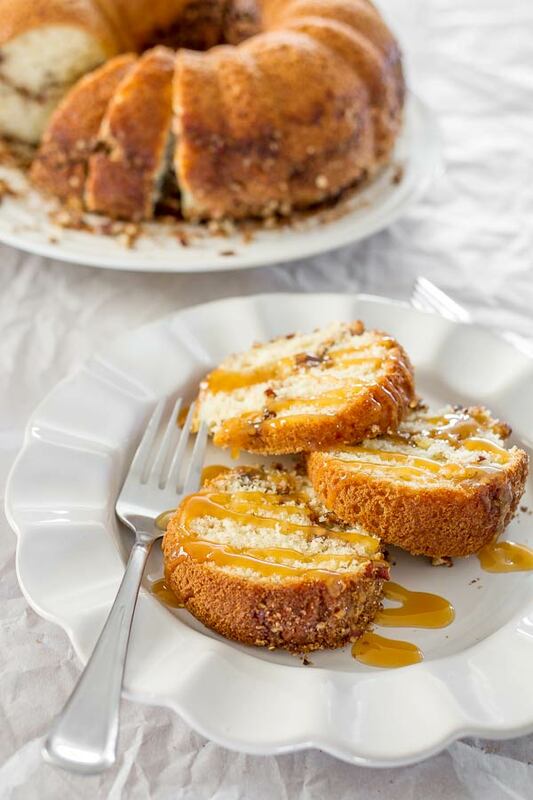 Butter a bundt pan and pour half of the batter inside it. Next add half of your pecans mix on top of batter. Try to spread them out as evenly as possible, then add the remaining batter and pecans mix in consecutive layers. Pretty easy, eh? Bake at 350° F / 177° C for about 45 minutes. Let it cool for about 15 minute before you remove it from the bundt pan. Enjoy! In a mixing bowl, add the butter and sugar and mix until light and creamy. Add the eggs, vanilla extract, sour cream and yogurt and mix well. In another bowl, mix the flour with the baking soda and baking powder. 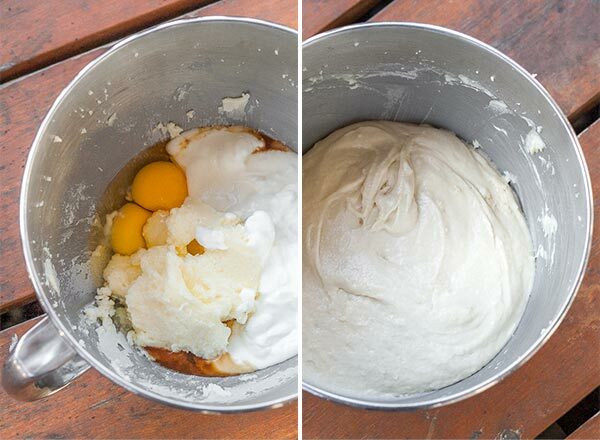 Add the flour mixture to the mixer and mix everything to perfection. In a small bowl mix the chopped pecans with the brown sugar and cinnamon. Preheat oven to 350° F / 177° C.
Place half of the batter in a bundt pan. Pour half of the pecan mixture over the batter. 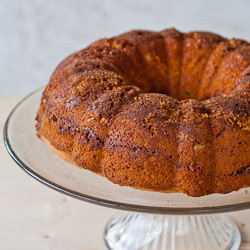 Repeat with remaining batter and pecan crumble in consecutive layers. Bake for 45 minutes. Let it cool for about 15 min before removing from bundt pan.